XYZprinting's Da Vinci 1.0 AiO is coming to Australia in April. XYZprinting has launched what it claims is the world’s first all-in-one 3D printer for consumers, and it will soon be available to buy in Australia. 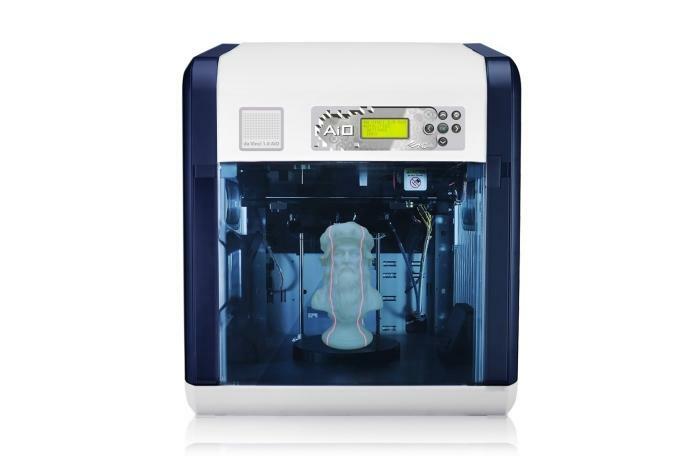 The da Vinci 1.0 AiO is capable of not only printing 3D objects, but also scanning them, and will be available for $1299 in April 2015 via distributor, MMT. The new machine gives end users and entrepreneurs the ability to use one device for both scanning and printing, with XYZprinting pointing out that it can be a good entry point for users who want to print their own models, but who may not have the understanding of how to build 3D models with the intention of then 3D printing those models. A 3-step process of scanning, editing, and printing is said to be achievable with a minimum of software knowledge. In a press release, the company claims that its all-in-one da Vinci 1.0 AiO device can scan an object in 3D within five minutes, using a turntable, a 2-megapixel camera, and dual-head scan technology to achieve accurate results. Algorithms are used to fill in voids during the scanning process, and the editing process has a ‘smart-fix’ option to enhance 3D scans. It can save scanned objects in the .das format (for editing), or in the .stl format (ready for printing). The printing process is FFF (fused filament fabrication) via a single-nozzle print head, with a ‘fine’ printing mode of 100 microns (standard printing being 200 microns).The printing filament can be either ABS (acrylonitrile butadiene styrene) thermoplastic or PLA (Polylactic acid). Maximum build area for 3D prints is 20x20x19cm, while the maximum object 3D scan size is 15x15cm. It will work on Windows machines (Windows 7 and above) or Macs (OSX 10.8 and above).